Sita Mata Wildlife Sanctuary is a wildlife sanctuary situated in south-east portion of Pratapgarh district Rajasthan, and has been declared as the protected forest area vide Government of Rajasthan. Sita Mata Sanctuary is a dense forest land which is about forty percent of the total land area of this developing district. Sita Mata Wild life Sanctuary is the chief attraction in Pratapgarh. The landscape of the area is rising and falling because of the confluence of three different geological formations- Malwa Plateau, Vindhyachal Hills and Aravali ranges. There are stories of the mythical Epic from The Ramayana is associated with the sanctuary as Hanuman and Sitamata temples and other places of historical and mythological importance are found here and the designation of the sanctuary has been named after it. It is the only forest region, where more than half the trees are the valuable teak. More to mention are Salar or Boswellia Serrata Rox, Tendu or Diospyros melonoxy Roxb., Bad or Ficus bengalensis, Peepal or Ficus Religiosa Linn., Babool or acacia arabica, Neem or Azadiracta Indica, Arinja or Acasia leucophea, Siras, Churail, Kachnar, Gulmohar, Amaltas, Bakayan, Ashok, Mahua, Semal, Goondi, Khejadi, Kumta or acacia rupesris, Amla, bamboo, Sindoor, chironjee, Rudraksha” and Bel trees are also found in abundance in Sita Mata Wildlife Sanctuary. There are infinite numbers of climbers and shrubs make the place a worth visit. Out of 108 varieties of high value medicinal herbs, 17 belong to the rare species that are found here. 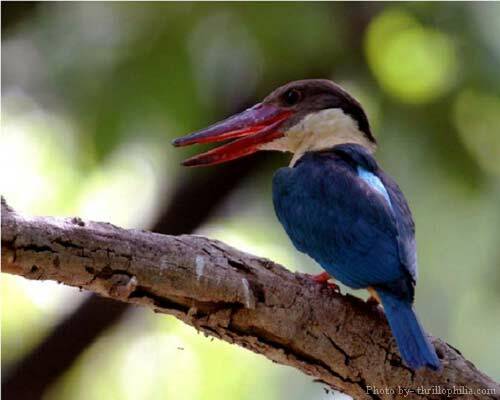 Sita Mata Wildlife Sanctuary is a perfect home to the birds. You can see the little grebe, little cormorant, Indian darter or the Snake bird, Gray Heron, Pond heron, cattle egret, little egret, painted stork, white necked stork, spoonbill, lesser whistling thrush, Rubby shelduck, Pintail, cotton teal, spotbill, Nukta, Parah kite, shikra, white eyed buzzard, king vulture, white backed vulture, Tawny eagle, white scavenger vulture, Eastrel, Black partridge, Rain Quail, Jungle bush quail, Indian peafowl, Saras crane, White breasted water hen, Moorhen, Purple moorhen, common coot, pheasant tailed jacana, Red vettled lapwing, Red shank, wood sandpiper, common sandpiper, Little stint, Black winged stilt, stone curlew, Indian courser, River tern, common sand grouse, Green pigeon, Blue rock pigeon, Red turtle dove, Indian ring dove, spotted dove, little brown dove and many others. Among the wildlife species you can watch Chousingha or the four-horned antelope, Caracal, wild boar, pangolin, leopard, hyena, jackal, fox, jungle cat, porcupine, spotted deer, wild bear, and neelgai are other animals found here. Sita Mata Wildlife Sanctuary is located in Pratapgarh District of Rajasthan about 45km from Pratapgarh City. By Air : Udaipur Airport is the nearest airport to the park. By Rail : Mandsaur Railway Station in Madhya Pradesh is the nearest station to Pratapgarh about 28km away while Chttorgarh Railway is the nearest in Rajasthan about 110 km away. By Road : Daily bus services connect pratapgarh with Chittorgarh (110 km), Banswara (85 km), Udaipur (165 km), Dungarpur (195 km), Rajsamand (133 km), Jodhpur (435 km), Jaipur (432 km) in Rajasthan; Ratlam (85 km), Mandsaur (32 km) in M.P. and Delhi (705 km).